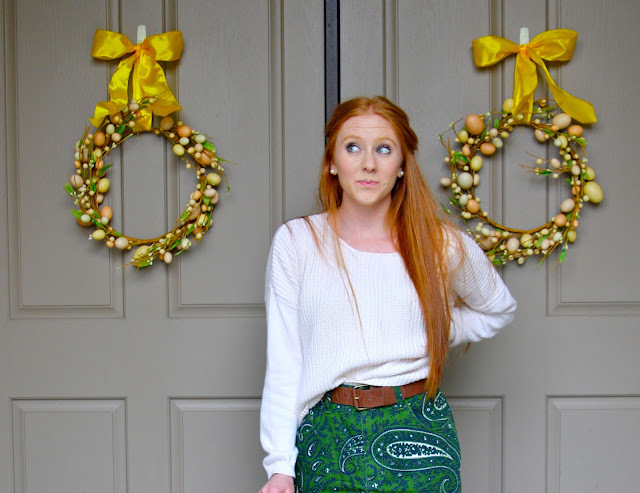 oh and can you tell how happy i am that it's almost easter? even though easter may not be my favorite holiday, i sure do love the springy time of year!!! and since it's good friday i get to celebrate over a 3 day weekend, thank goodnesss...i just can't wait to spend time some much needed time with my guy and family, yesss ahhh it's going to be so blissful! do you beauties have any plans? Those shoes are awesome as well. Lovely post! I absolutely adore that BOW! you wear it so well!! Love these pics & what a gorgeous ring! I also love your Easter garlands. such a wonderful outfit! 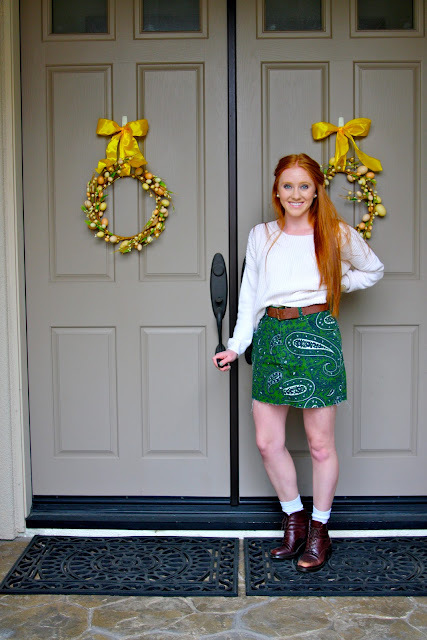 i love this skirt, the green paisley is so beautiful and just perfect with your hair! isn't easter monday also a free day? and in case you wonder: yes i'm a new reader of your blog, i just found it two minutes ago via your comment on the blog of skinny moonstick! 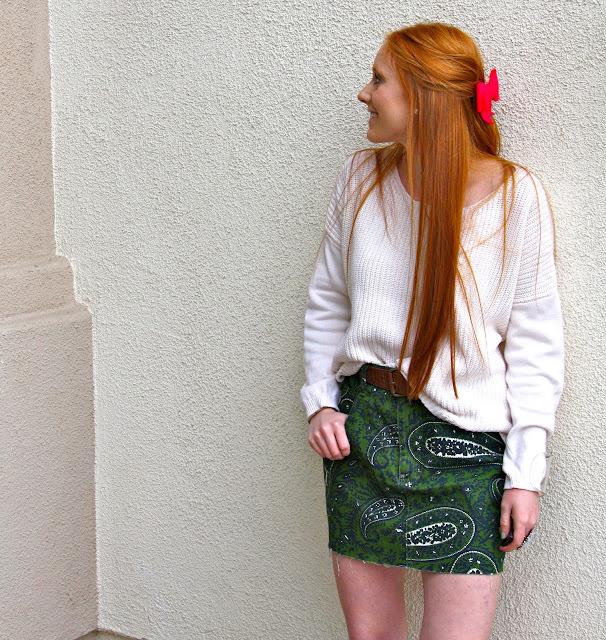 and I just had to become a follower (via bloglovin), your style is wonderful! I hope you'll find perhaps some time to visit my blog too and tell me what you think? Bellissime foto, bellissimo outfit, bellissima tu!!! Gosh i love the bow, what a fun otufit! oh wow, i love that skirt!! it's beautiful :) this outfit is great! You are lovely, i wish so badly I could pull off red hair! Plus that skirt is great. New follower! aw super cute, i can't leave the house without having socks with my shoes anymore- i think it perks an outfit right up. and i've been searching high and low for a bow like that, you look adorable! I love your hot pink bow! It looks absolutely gorgeous in your hair. So cute!! Love the bow accent! The color is great! Such a fun outfit! The bow is awesome, and I always love your hair! gah, love the skirt! i haven't seen paisley in forever!! the deep green is pretty, too! oh, yay! i just got on instagram, too! i'll look for you. i'm @rockoomph. Happy almost long week-end dear!! Lovely!! Your hair is just beautiful. Great post!!! Love your blog and im following you!!! love your hair and style!I really like your blog, would you like to follow each other? That emerald green skirt really makes your gorgeous red hair pop! What a fabulous look! You are gorgeous, seriously! Love your hair! You are so cheerful ♥ i love it. wow , your photos are great! 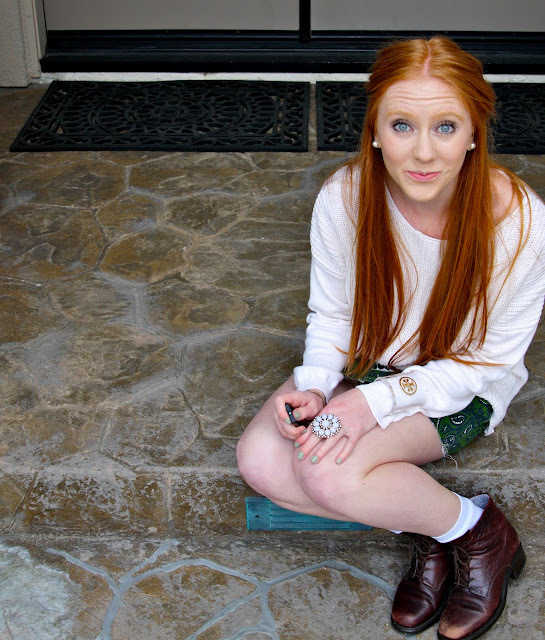 WOW, you are so loveeeeeeeeely, the skirt is fabulous with the white sweater andd i like the boots a lot! Happy Easter, sweetie!! Hope you enjoy your lovely weekend, and, btw, you look amazing! I love the pink and green on you- looks so happy pretty!!! Beautiful outfit! 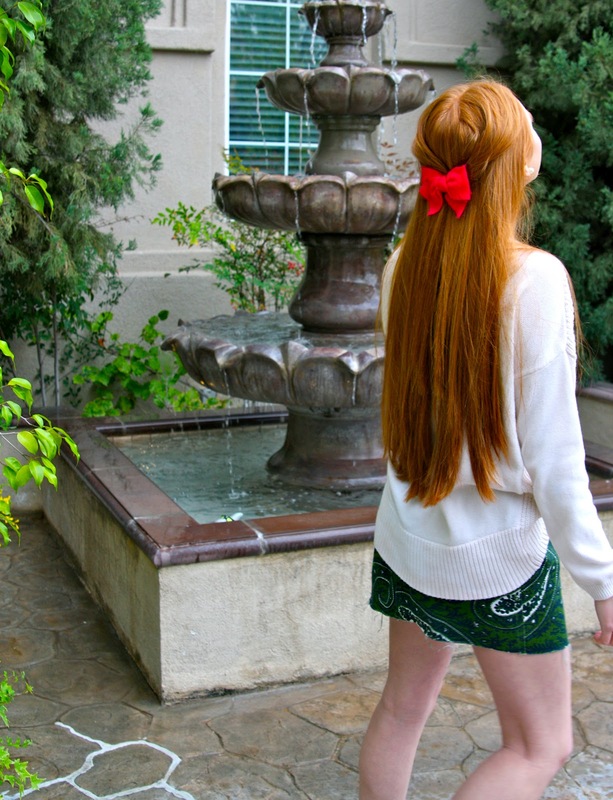 Your skirt is amazing, and I think I fell in love with your hair <3 They're just soooo beautiful!!! I'm following you and I'll be very grateful if you visit my new blog! Omg, you rock. Love your style. 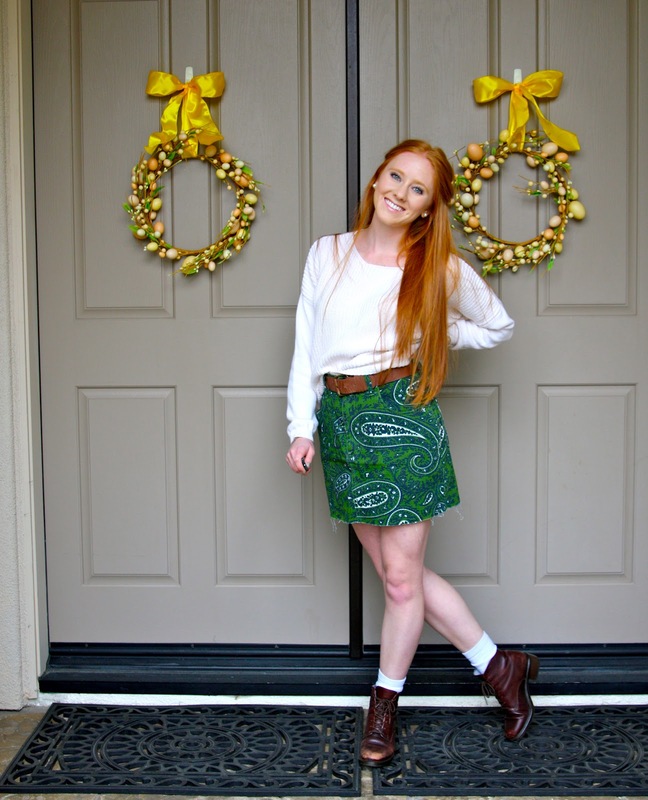 The print on that skirt is ahh-mazing!! I'm loving your blog girl, I'm your newest follower! I hope you'll follow me back and we can keep in touch. I love discovering new blogs! That pink bow is beyond adorable! I love how unexpected it is. The rest of the outfit is stunning, as usual. And I totally agree - the more stressed I got about school, the more I realized the little silly things were important! I would like to invite you ente my Romwe giveaway: you can win a collar and 40$ freebies! The color of that bow is so great in your hair I can't stand it! hahahahaha, loving the green skirt too!